Noodle Joust is a super easy and quick game that you can throw together by simply grabbing a few items you may already have on hand. So get ready to get your joust on! Start by selecting 8 participants and separating them into 4 pairs of 2. Each pairing will square off in a good old-fashioned joust. 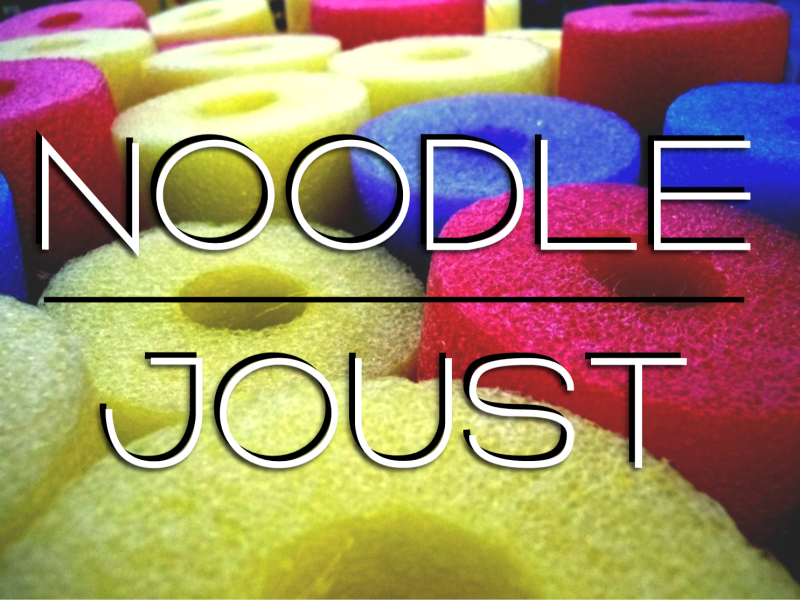 Okay, maybe not a good old-fashioned joust, but a new and fun Noodle Joust. Have each participant in your pairing place that hat on and make sure it is secure. You will then hand each one a pool noodle. The goal of the game is to use the pool noodle to knock off your competitor’s hat. The only rules for the game is that the pairing must hold the bottom of the pool noodle (unless otherwise stated) and remain in the parameters you set beforehand. We suggest a small boxed area that can be taped or marked off by items. If one of the participants continually steps out of the box, they are eliminated (give two warnings before eliminating). Whoever knocks off their opponent’s hat first is the winner. They four winners will advance to the semi-final round and then you will move on to the championship round. The winner of this round is crowned noodle king or queen! Note: If participants are struggling to knock a hat off, have them move up the pool noodle (hold it at the half way point) to give them a bit more control. You can also make the players loosen their hats to make knocking it off easier. Play with more players and work your way down. If you play with a group of larger than 8, you will need to have many more pool noodles and hats on hand so that players can compete simultaneously. 1.Have an extra pool noodle or two on hand in the event one is damaged or breaks. 2. Set a time limit for each round. You don’t want the game to drag on forever. You can also expedite the game by shrinking the playing area. 3. Spray paint a pool noodle gold and award it to the winner!